I am deeply grateful to have known Pete Seeger. I first met him after a concert (on my birthday) in 2001, and we did an hour-long interview for my high school newspaper. In 2002 I organized a week-long event at my high school, Human Rights Week, and I asked Pete to give a concert. I was amazed when he agreed to play; the concert was a complete success. Since then, I went to see him perform every chance I'd get. I saw him so frequently that he'd recognize me whenever we met - and I always made sure to meet him after a show. I met Pete for the last time this past October, when I had the privilege of mixing sound for Toshi Seeger’s memorial service. When Pete passed away six months ago, it left a huge void in my heart that I never thought would be filled. Then I got a call from Kitama Cahill-Jackson, who is the grandson of Pete & Toshi Seeger. I had met and worked with him at Toshi’s memorial, and I was delighted when he invited me to help produce a five-day festival, Seeger Fest, that he was putting together to remember his grandparents. Of course, I said yes. For four months, I worked with Kitama's team and we met in a back room on Broadway to plan a huge series of events, including concerts, film screenings, a photo exhibit – quite a lot for a small group of young people to take on. My job as Technical Manager of the Festival was to be in touch with all of the artists about their technical needs, which I then translated into stage plots, encompassing microphone positioning and musician placement. I designed the stage plots for four of the five venues: Pier 46, The Bardavon Opera House, Hunts Point Riverside Park, and Lincoln Center Out of Doors. I got to use my sound mixing skills too; I mixed audio for both the first and third days’ events. On other days, I assisted the Stage Manager to ensure that the concerts ran smoothly. It was very gratifying to see what I had accomplished. 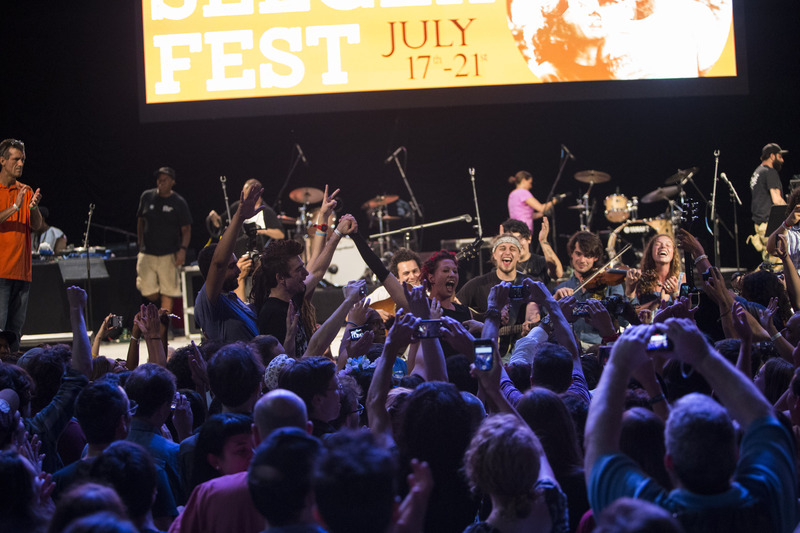 The first event, on July 17th, took place at Pier 46 on the Hudson River, where there was a screening of the documentary Pete Seeger: The Power of Song. I’d seen it before, but there’s something very special about watching it on a huge screen while sitting along the river that Pete fought to save. And there was music, oh yes, provided by The Chapin Sisters, Alana and Adira Amram, Kristen Graves, and others. Of course, Pete was referenced more than once during the concert; The Chapin Sisters sang a beautiful arrangement of "Turn, Turn, Turn," and Kristen Graves, who performed with Pete at one of his last concerts, sang a wonderful song she wrote in tribute to Pete, lovingly titled "The Pete Song." These two songs, for me, became themes of the festival. On July 18th we all went up to Poughkeepsie to produce Pete Seeger’s Memorial Service at the Bardavon Opera House. This wonderful evening included stories, memories, and songs by those who worked with Pete, including Fred Hellerman (of The Weavers), David Bernz, Emma’s Revolution, Guy Davis, Lorre Wyatt, Happy Traum, David Amram, Peter Yarrow (of Peter, Paul & Mary), and Tom Chapin. A particular highlight for me was Paul Winter – whose name I knew but I’d never heard him live before. Even Joe Hickerson came to remember his longtime friend. Joe had co-written “Where Have All The Flowers Gone” with Pete. It was a very long show (5+ hours) but it did not feel like the evening was dragging; rather it was a welcome and long-needed opportunity to reflect and remember. The next day Seeger Fest moved into Hunts Point Riverside Park in the South Bronx. In partnership with Rocking The Boat, we put on a community festival featuring food, music, and boat rides. We built an outdoor stage and hosted 11 bands in 7 hours. It was a very eclectic mix of music, including folk, blues, reggae, hip-hop, rap, bluegrass, Latin, and children’s music. DJ Logic, Guy Davis, Bob Reid, Tom Chapin & The Chapin Sisters, AKIR, The Abrazos Orchestra, The Owens Brothers, The Tony Lee Thomas Band, and Kristen Graves all played their best to celebrate Pete's life and art. One of the big highlights of the day was the final set by The Rapper’s Delight Experience, consisting of original members of the Sugar Hill Gang, famous for originating hip-hop music. There were other events on July 19th further up-river, including a potluck supper at the Beacon Sloop Club and a square dance in the Catskills. But since I was running sound at Hunts Point I could not attend those other events. That night on the upper west side, there was an exhibit of rarely seen photos and films by and of Pete & Toshi Seeger. By all accounts, Seeger Fest was a complete success. It was a wonderful, magical, inspiring festival, and I was honored to play an active role in pulling it all together. I think it went even better than we had hoped. Months and months of planning had indeed paid off. We on the production team adhered to Pete’s belief that every voice counts as we all offered opinions and suggestions as to how to make this the most fitting tribute to Pete & Toshi. We all brought our talents to the table and worked together to support Kitama's grand vision to honor his grandparents. And I think we all learned that if like-minded individuals truly believe in an idea, they can pull off the seemingly impossible.